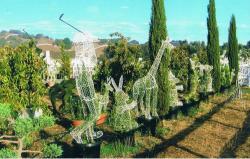 Our topiary frames come in many different attractive animal and other topiary shapes. The topiary frames are hand-weaved with a smooth flowing technique and mounted on secure metal topiary frames. These topiary frames are detachable into multiple partitions and metal clips attached to the topiary frame join the partitions securely. The topiary wire frames may be opened up for placement on larger shrubs. About Us We are a Wholesale Topiary Design and Manufacturing Company. Our main objective is to serve the wholesale and nursery market for topiaries. We take pride in the unique way of producing our topiary frames. »Our topiary nursery in San Martin, California. Click Contact for address and fax, directions. Catalog See our printed topiary catalog, online. Usually reserved for bulk wholesale topiary orders. Are you a Non-Profit Organization (Gardens, School, Senior Center)? Receive Topiary Discounts. We want to help your organization with Topiary. Email us sk703top@yahoo.com for promotion pricing just for non-profit groups. Our topiary frames ship directly from our California nursery. We ship via Fedex and USPS. Returns within 14 days in original condition are accepted, with a 10% restocking fee. Refunds issued are for the product cost only (less 10% restocking fee) and WILL NOT include costs for shipping and handling.